Create a Halloween mantle with all of your favorite Krylon® colors, textures, and finishes! Start by creating a vintage message mirror. In a well-ventilated area, place the mirror on a flat, covered surface. Remove the cardboard backing to expose the back of the glass. While wearing gloves, a mask, and protective eyewear, use a paint brush to cover the entire back of the glass with paint thinner. This removes the silver finish on the back of the glass. Once the paint thinner has been sitting for 15-20 minutes, use a putty knife to scrape off the silver finish. After it is all removed, clean the surface thoroughly. Once the surface is clean and dry, use a plastic funnel to pour a very small amount of muriatic acid into a plastic spray bottle. Spray a very small amount into random areas on the mirror. You will leave the drips to dry. This will create that spotted distressed look once it dries. In an well-ventilated area on a covered, flat surface that is away from any paint thinner, tape off the mirror so only the frame is exposed. After reading the label for safety and application instructions, apply two to three coats of Krylon® ColorMaster™ Paint + Primer in Gloss Pruple. When the paint is dry to the touch, remove tape. Once the paint is fully dry, add a vinyl decal quote to mirror. Next, spray paint the additional mantel accessories! Place large letters that spell out "BOO" on a covered, flat surface in a well-ventilated area. Using two coats of Krylon® ColorMaster™ Paint + Primer in Gloss Purple, paint the letters and allow to dry completely. For the pumpkins, use a variety of your favorite Krylon® finishes and textures. To achieve the look pictured, use Krylon® Shimmer Metallic in Gold Shimmer and Silver Shimmer, Krylon® Glitter Blast™ in Starry Night, and Krylon® ColorMaster™ Paint + Primer in Satin Black. 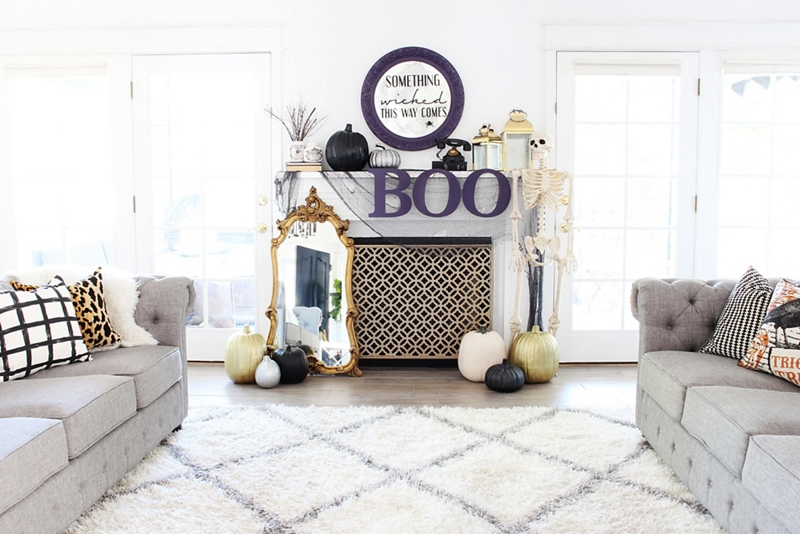 Once all décor pieces are fully dry, set up your Halloween mantle display and enjoy!